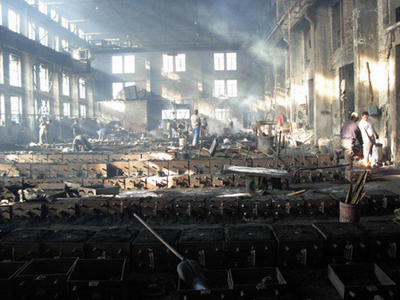 Foundry is also called as casting or founding, which is a kind of production method for metal parts. The process is melt metal into hot liquid, make molds, then pour the liquid metal into the molds. After cooling and cleaning process, we can get the metal cast parts with designed shapes, dimensions and chemical composition. Metal casting process is a kind of method to produce metal castings, which includes making casting molds, making sand cores, melting metal, pouring, cooling control and cleaning processes. Sand casting process is a molding method, which uses the sand as the main molding materials. This process includes green sand, resin sand, shell molding, water glass sand casting processes. The casting processes different with sand casting processes. Such as lost wax investment casting process, metal mold casting process, pressure or low pressure casting process, ceramic mold casting, centrifugal casting, lost foam and continuous casting processes.